Kenner, who were by now on their Empire Strikes Back line and limbering up for Jedi released a small, almost experimental series of four main figures. These were Indy himself, Marion Ravenwood, Gestapo creep Toht and the Cairo Swordsman. Remember that fellow who intimidated Jones for all of twelve seconds before a dysentery-riddled Harrison Ford shot him impatiently? Yeah, him. Now remember those four because you’re going to be seeing them again repeatedly. Kenner had had great success with a mail-in Boba Fett for their original Star Wars line and for this one they opted for the one that probably didn’t present as much play opportunity as the others, Indy’s rival Belloq in ceremonial robes, all ready to open up the ark of the covenant and have his head explode, which sadly wasn’t a feature. 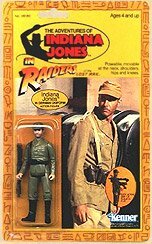 These Indiana Jones Action Figures were very similar to the existing Star Wars and Empire line only with jointed knees first tested in the Butch & Sundance: The Early Years line and a quick-draw spring-loaded arm. As well as the basic assortment there were also Well of Souls and Map Room playsets, adding crucial context for play. 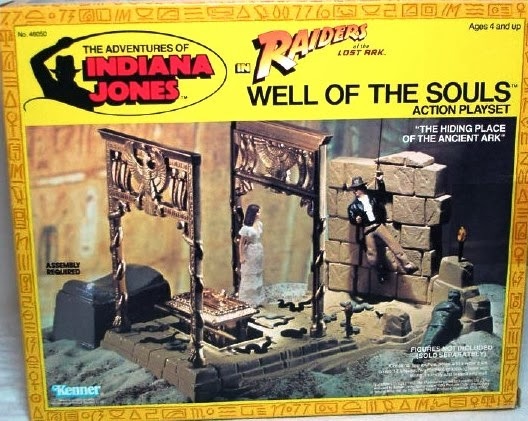 There were also a 12 inch Indiana Jones Action Figures in the same vein as their Star Wars line of that scale and of course by now Kenner were experienced at sculpting Ford’s likeness. 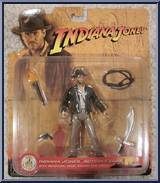 The first series of 3.75 inch Indiana Jones Action Figures included Indiana Jones, Marion Ravenwood, Toht, and the Cairo Swordsman from Raiders of the Lost Ark and the mail-in offer for the Belloq in Ceremonial Robe figure. 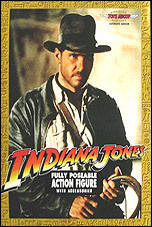 Indiana Jones: 7 points of articulation: neck, shoulders, hips, 2 knees and a quick draw figure. And came with a revolver and whip. 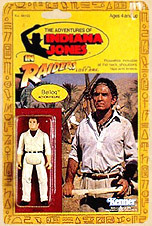 Marion Ravenwood: Kenner didn’t expect the Marion figure to be popular so as a result it had a very short production run, however many fans were after this figure to complete their collections and as its demand rose so did its price. Unlike Indiana she only had 5 points of articulation: neck, 2 shoulders, and 2 hips but she was the only figure in the series that had no knee joints because of her fabric dress, which was removable, she also came with a monkey and a clear plastic stand. 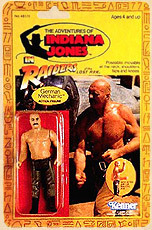 Toht: The nazi psycho name is never spoken in Raiders of the Lost Ark but his presence is unmistakable. 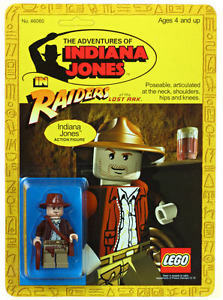 This figure was probably the most common of them and like Indiana had 7 points of articulation: the neck, 2 shoulders, 2 hips, and 2 knees. 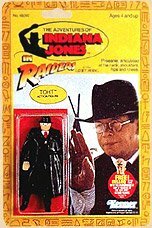 He also came with a removable vinyl trench coat and a small pistol (different from the one included with the Indiana Jones figure). One of the nice details added to this figure was the medallion symbol "burned" into his right hand. Cairo Swordsman: The Swordsman was also a common figures and had 7 points of articulation: neck, 2 shoulders, 2 hips, and 2 knees. He also came with a removable snap-around robe, one sword, and a knife. The knife was exactly the same as the one included with the Monkey Man figure in the Streets of Cairo playset. 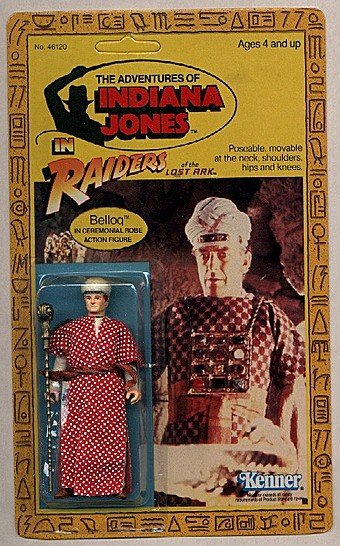 Mail-in Belloq in Ceremonial Robe: Originally only available as a mail-away offer in the first series this was a highly sought after figure and came uncarded and poly-bagged. Like the other figures in this series he had 7 points of articulation: neck, 2 shoulders, 2 hips, and 2 knees and came with a removable robe, a removable jeweled breastplate, anda staff. It is rumoured that there are only a few of the CARDED Belloq in Ceremonial Robe figures in existence and it is thought that they were salesmen’s samples and came on the 9-back card. 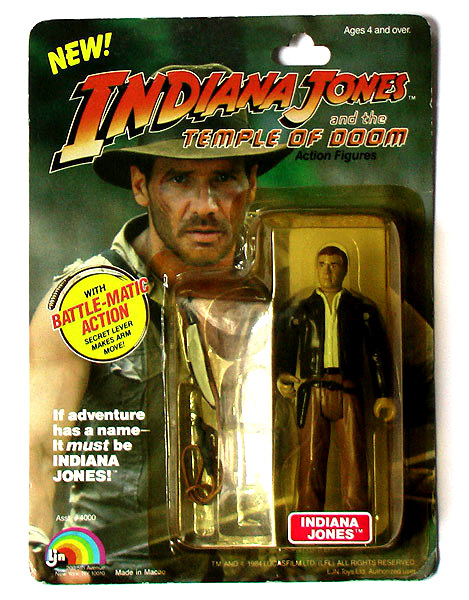 the first series of Indiana Jones Action Figures also came with two play sets in a rectangular boxes with identical font and backs. They were packaged in a plastic bag unassembled with the 2-piece breakaway wall separate. These play sets have become popular among collectors, especially in mint, boxed condition due to the quality and quantity of accessories that was included. 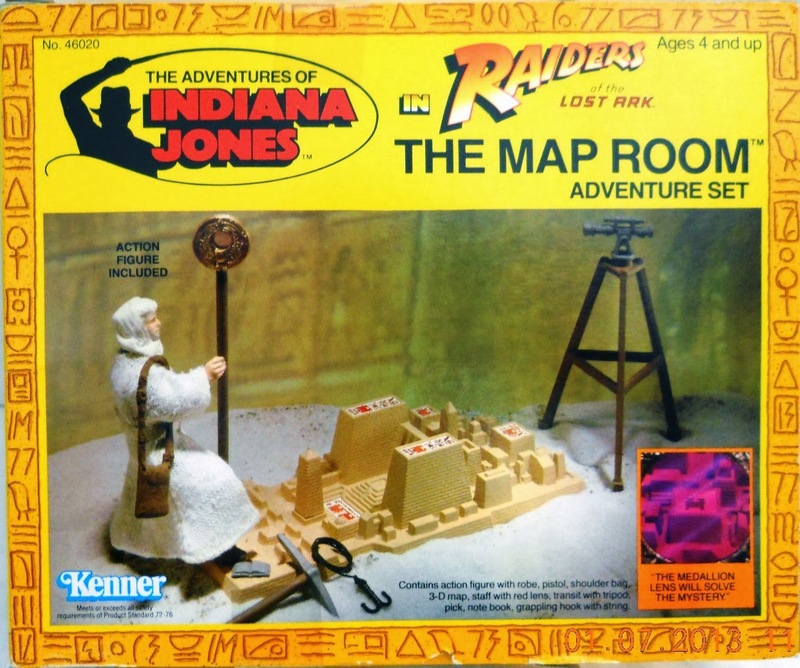 The Map Room Playset came with an exclusive Indiana Jones figure in Arab Disguise. 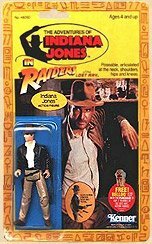 Kenner expanded their first release of Indiana Jones Action Figures in 1983 with a second series of ten figures; however three of the figures in this set were re-releases of the same figures from the first series, with a new 9-card back. The card in this series also no longer featured the Belloq mail-in offer. 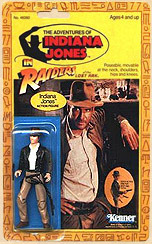 Tthis series of Indiana Jones Action Figures had a much smaller production run than the original series and the figures came on a 9-back card rather than the original 4-back card figures. These figures are therefore scarcer than the original series and were hugely popular with collectors and fans disappearing off toy shelves almost overnight. 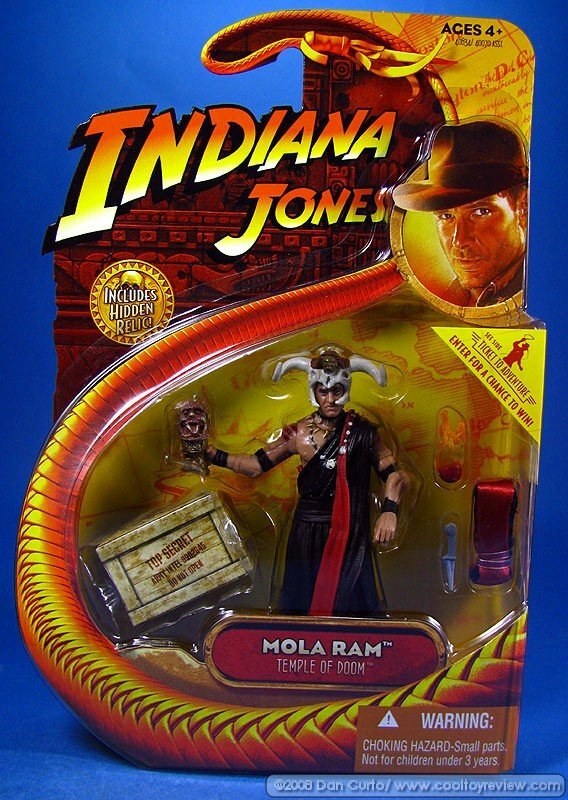 The three re-released figures included Indiana Jones, Marion Ravenwood and Toht. The Cairo Swordsman was also re-released but unlike the others it was re-released on the original 4-back card still featuring the Belloq offer. 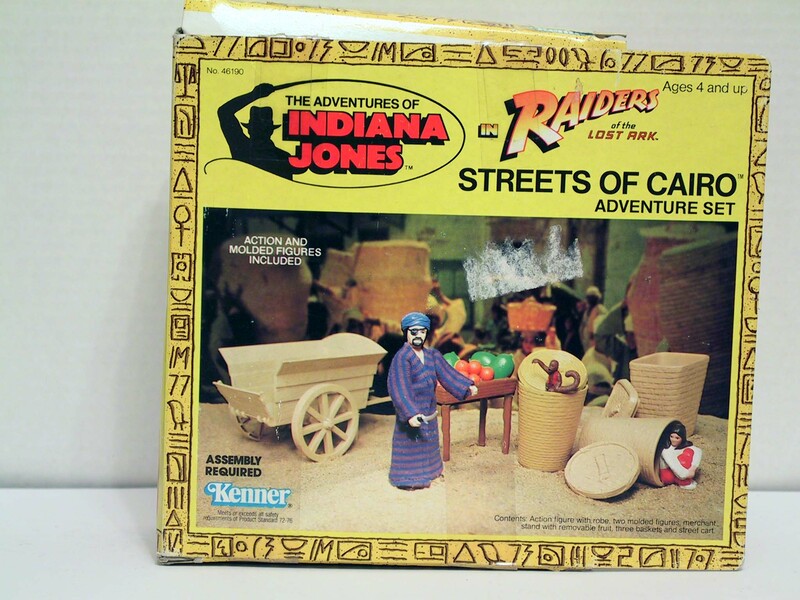 A third play set was also released with this series, the Streets of Cairo, and a Desert Convoy Truck. 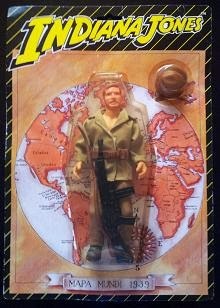 Indiana Jones in German Uniform: This series featured a new Indiana Jones in a German uniform with the quick draw feature from the first series and the regular points of articulation, it also came with a bazooka. German Mechanic: This figure was only available in this series and like the others had 7 points of articulation: the neck, 2 shoulders, 2 hips, and 2 knees. This figure also featured the quick draw feature a came with a handy wrench, ready to bash someone over the head with! 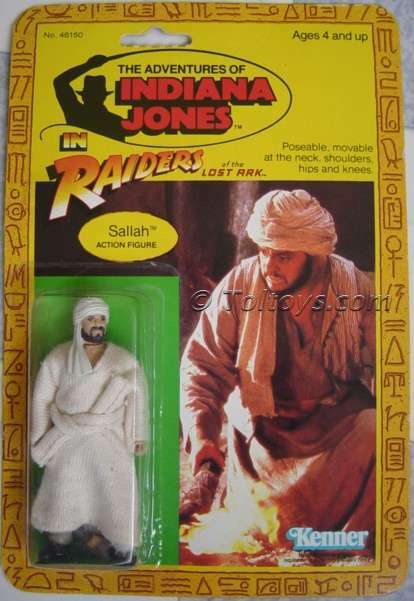 Sallah: Like the earlier figures this had 7 points of articulation: the neck, 2 shoulders, 2 hips, and 2 knees and a removable robe and a torch which was the same as the ones included in the Well of the Souls playset. 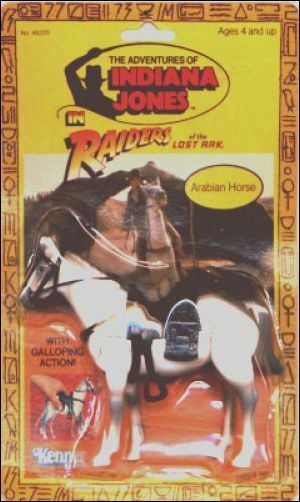 Arabian Horse: This was a nice touch to this series and came on a slightly larger than the normal Indy action figure card (about 1/2" wider and 1/2" longer) and came complete complete with removable reigns, bridle and saddle and a "galloping" action feature that was activated by a button on the horse’s right. 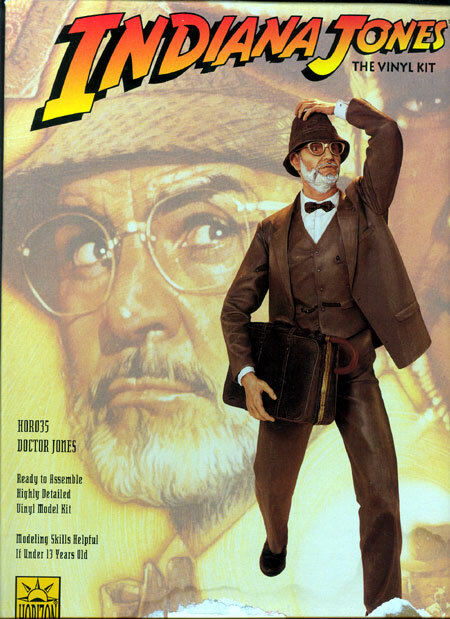 Belloq: There were three Belloq figures released in total including this one, i.e. 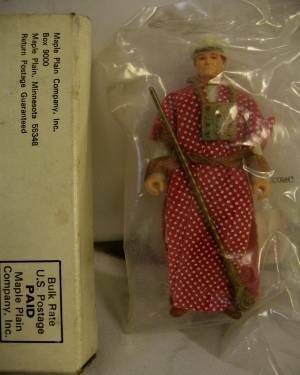 the official series two Belloq figure, the original UNCARDED Belloq in Ceremonial Robe and a CARDED Belloq in Ceremonial Robe. 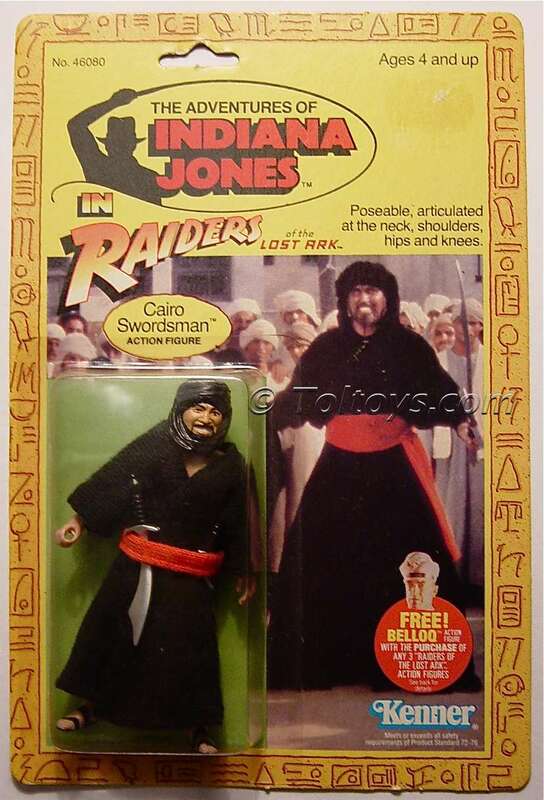 The only playset to be released with the series two figures was the Streets of Cairo playset which featured an exclusive Monkey Man figure and a non-articulated, crouching Marion figure. The Monkey figure was also molded in a different pose to the one that came with the carded Marion figure. 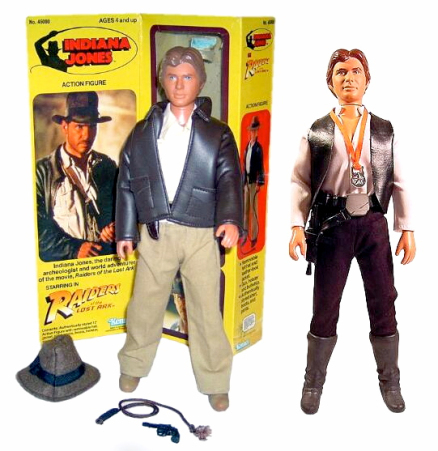 Taking advantage of the fact that Harrison Ford also starred in Star Wars as Han Solo Kenner used their earlier Star Wars mold for the 12-inch Indiana Jones figure released in 1983. 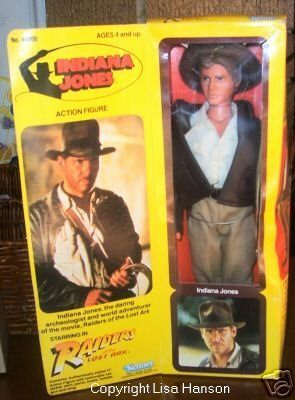 The only real difference between the two is that the Indiana Jones figure had blue eyes whereas the Han Solo figure had brown eyes. Accessories: a Whip, Gun, removable jacket, hat, shirt, pants and boots.